If you are short of time in Chiang Mai, or have your accommodation booked for every night, choose from some of our One Day Tours. These tours pick you up in the morning and bring you back to Chiang Mai in the evening. You can book them if you are staying in Chiang Mai, or at any other guest house or hotel in Chiang Mai. To book a One Day Tour, simply go to our Tour & Trek reservation Form, fill in the details and send. We will confirm your reservation by E mail. You need to be in Chiang Mai the day before the tour starts to hold your reservation. If you are not staying at the Sarah Guesthouse, please call us to confirm your tour, telling us your hotel/guesthouse name and room number . 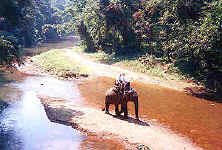 This one day trek includes all the activities of a trek - elephant riding, rafting and hiking. The trekking area is approx. one hour south of Chiang Mai in the foothills of Doi Inthanon. Ride on the elephants for approx. 1hr. and cruise down the river on a bamboo raft at the end of the day for approx. 1hr. During the day walk to visit Hmong and Karen villages and relax at a waterfall. Take a Thai Cookery course 1 day, Itinerary depends on the day (check here for menus). Pick up from guest house at 0900 and drive to rafting camp. Arrive at camp with time to relax and have lunch. Instruction on paddling and river safety. At midday, start the river raft journey which lasts approx. 3hrs according to time of year. Rapids are graded 2-5, this also varies with the time of year (there being more water July-Oct and less water Feb-June). Rafting the whole section of the river depends on river conditions and experience of participants; safety being the first priority. But the majority of the river is always raftable. Approx 1600 stop for short break at end of trip to change to dry clothes and then return to Chiang Mai. Back to hotel aprox. 1800. Depart from the guesthouse and drive north of Chiang Mai to the elephant camp. 0930, elephant ride for approx. 1hr. 1100, mountain biking for approx. 1hr from a local village to the rafting camp. Arrive at rafting camp and have lunch. 1330, instruction on paddling and river safety. 1400, start the river raft journey which lasts approx. 2-2 1/2hrs according to time of year. Rapids are graded 2-5, this also varies with the time of year (there being more water July-Oct and less water Feb-June). Rafting the whole section of the river depends on river conditions and experience of participants; safety being the first priority. But the majority of the river is always raftable. Approx 1600 stop for short break at end of trip to change to dry clothes and then return to Chiang Mai. Back to hotel aprox. 1730. This one day tour visits the Doi Inthanon National Park, south of Chiang Mai. Drive to Chomthong (approx. 1hr) then up through the National Park stopping at waterfalls and at the top of the mountain. You will see the pagodas at the top and the trees and flowers of this area, which vary due to the higher altitude. A good tour for nature lovers to see waterfalls, mountain scenery and and a variety of plantlife. Visit the elephant camp approx. 40kms north of Chiang Mai. This camp has been chosen for it's location in a valley set amongst the forested hills. Activities of the day include watching the elephants in their daily routines, an elephant safari of approx. 1hr, a ride in a traditional oxcart and rafting down the Mae Taeng River. On the way back visit a Hmong hilltribe village. This one day tour starts at 7am , when you are picked up from your guest house. Drive north of Chiang Mai, to Chiang Rai, stopping at the Mae Kachan hotsprings on the way. Stop in Chiang Saen, on the banks of the Mekong River and visit the Golden Triangle (the point where the three countries of Thailand, Laos and Burma converge). Tour the border town of Mae Sai, famous for the produce brought over from Burma and China. 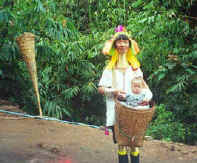 Then visit hilltribe villages of the Yao and Akha tribes. On the way back to Chiang Mai, stop at the small town of Thaton. Drive north of Chiang Mai for approx. 1½ hrs, first visiting Chiang Dao Caves. After exploring these ancient cave temples, continue on to visit a Hmong tribe village and the town of Thaton. 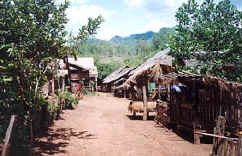 In the afternoon visit the "Long neck" tribe village. It takes approx. 10mins to walk to the village from the road. After spending some time here, return to Chiang Mai. Copyright © 1998-2008 Sarah Guesthouse All rights reserved.